Elliott Stokes was Hollington United's man of the match in the 2-2 draw away to Willingdon Athletic. Hollington United Football Club had to settle for a 2-2 draw from a tricky match away to Willingdon Athletic on Saturday. 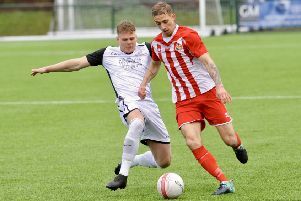 The Lions remain top of the Mid Sussex Football League Premier Division, but are only a point clear of second-placed Balcombe having played an extra game. In difficult conditions, Hollington struggled to find the kind of form that got them to the top of the table. Yet it was they who created the better chances, with Alan Foster shooting just wide and Dom Clarke heading against the post. Willingdon drew first blood, though, when a seemingly harmless cross went into the far corner after goalkeeper Elliott Stokes unfortunately slipped. 1-0 was nearly 2-0, but Stokes made a fantastic penalty save after the referee spotted a push by Sean Ray. It wasn’t long, though, before Foster equalised just on half time. The Lions completely dominated the second period and went ahead with a sublime volley by Clarke from just inside the box. For the first time in the game Hollington seemed to have control and they could well have added to the scoreline, but Willingdon equalised from a corner. Chances came and went towards the end, and Ricky Martin nearly won it at the death but for some good goalkeeping. The man of the match, sponsored by A2B Decorating, was Stokes. Hollington manager Scott Price said: “For me it was probably two points dropped if you judged the game on chances, but in reality, away to a team sitting third, conceded only three goals and missed a penalty, a point is a very good result. Hollington will travel to West Hoathly in round one of the Sussex Intermediate Challenge Cup this coming Saturday.